MEXICO CITY (Reuters) - Hurricane Rosa, headed for Baja California, weakened in the Pacific Ocean and was forecast to further wane in the coming days, the U.S. National Hurricane Center (NHC) said on Friday. Rosa, with maximum sustained winds decreasing to almost 120 miles per hour (195 kph), was now a Category 3 storm, coming down a notch on the five-step Saffir-Simpson Hurricane Wind Scale. It was about 625 miles (1,005 km) southwest of the southern tip of Baja California and moving northwest at almost 6 mph (9 kph). 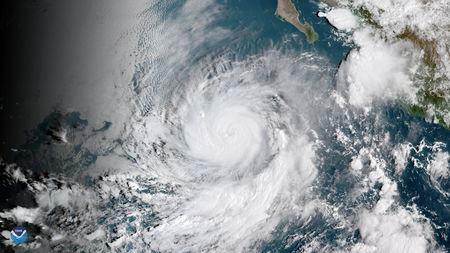 Rosa was expected to reach Baja California on Monday as a tropical storm. "Additional weakening is anticipated over the next few days, and Rosa could become a tropical storm by the end of the weekend," the Miami-based center said. Swells generated by Rosa are forecast to affect parts of the coastlines of southwestern Mexico, the southern Baja California Peninsula, and southern California late this week and over the weekend. "These swells are likely to cause life-threatening surf and rip current conditions," the NHC said. However, no coastal watches or warnings are in effect, it added.